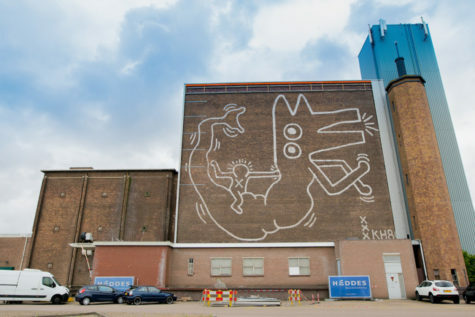 A mural by Keith Haring was revealed in Amsterdam last week, some 30 years after the US artist completed the commission, which was his gift to the Dutch city. The 40-foot-tall mural was painted by Haring in 1986 while he was in town for his exhibition at museum. It was covered a few years later when the entire facade of the brick building, which was then the Stedelijk’s art storage depot, had weatherboarding added to improve its climate controls. Installed by the artist over two days, the single-white line mural features a mythical dog-headed creature being ridden by one of Haring’s X-marked figures. The Dutch mural is slightly bigger than Haring’s other wall work in Pisa.